When lawyer Alexander McSween and a young Englishman, John H. Tunstall, began competing with local merchants Lawrence G. Murphy and James Dolan in the tiny community of Lincoln, New Mexico, in the late 1870s, the result was the Lincoln County War. From February 18, 1878, to February 18, 1879, the rivals fought for economic supremacy, first through the legal system and then with bullets, until law and order finally collapsed. Tunstall's murder by a sheriff's posse in February 1878 prompted his supporters, now styled "the Regulators," to regroup around McSween. On April 1, Regulators shot Sheriff William Brady and his deputy on Lincoln's main, and only, street. George W. Peppin replaced Brady as sheriff. In the following weeks, McSween and his partisans skirmished with Peppin's posses. McSween led his Regulators back into Lincoln on July 14, and for five days the town was rocked with gunfire. Pleas for help from a frightened resident brought Lt. Col. N. A. M. Dudley and his men from nearby Fort Stanton, but Dudley only stood by as Sheriff Peppin and his men besieged McSween's house. McSween died in a hail of gunfire, as a young outlaw going under the name of William Bonney, or simply "the Kid," led a desperate escape from the burning building. As a result of the violence, President Rutherford Hayes dismissed territorial governor Samuel Axell and appointed Lew Wallace, a former general (and later, author of Ben Hur), in his place. The U.S. Army was brought in to help civilian law officers, and the violence died away gradually. Governor Wallace's amnesty permitted most of the outlaws to go free; only William Bonney was convicted for the murder of Sheriff Brady. Bonney, by then known as "Billy the Kid," rode away from Lincoln branded forever with a reputation as an outlaw. 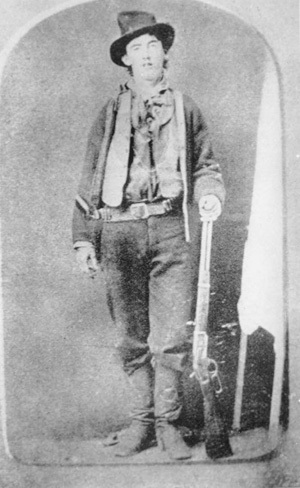 See also IMAGES AND ICONS: Frontier Violence / LAW: Billy the Kid. Nolan, Frederick. The Lincoln County War: A Documentary History. Norman: University of Oklahoma Press, 1992. Utley, Robert. High Noon in Lincoln: Violence on the Western Frontier. Albuquerque: University of New Mexico Press, 1987.